Just a heads up, this is a long one. 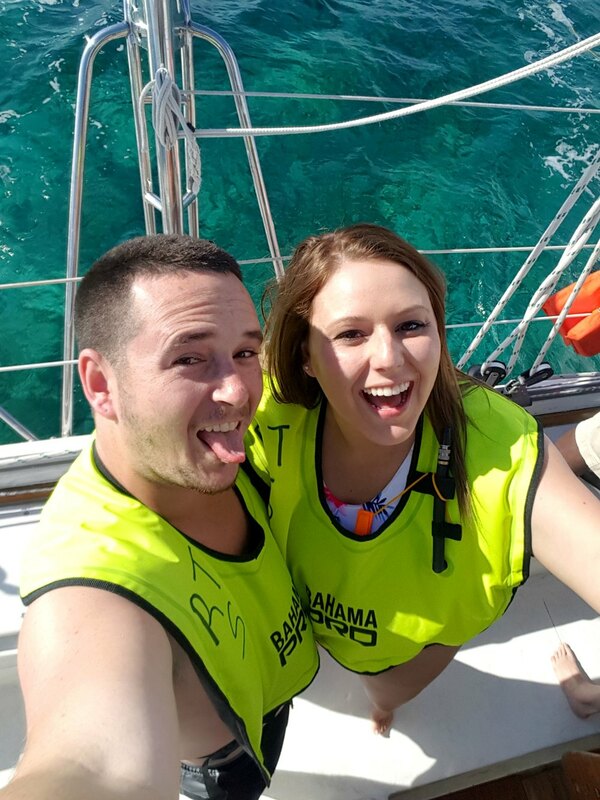 In March, B and I took a trip to the Bahamas. This is a recap of our adventure! After dinner, we tried out the tiki bar by the pool but left after one drink. Definitely not big fans of overpriced, under-boozed drinks. We eventually ended up at Flanigan's- an irish pub down the street from where we were staying. The bar was decked out in St. Patrick's Day decor and we got a free appetizer with our pitcher of beer. Score! We started the day off relaxing by the pool, then made our way to the timeshare presentation a.k.a five hours of our lives we could have spent doing literally anything else. Neither of us have ever been to a timeshare presentation before so we had no idea what to expect. It was pretty interesting and honestly, pretty convincing. But the thing that frustrated me the most was the fact that "no" did not seem to be a word in anyone's vocabulary. After the presentation we ate dinner and met up with my soon-to-be stepsister and her hubby for some drinks by the beach. B and I checked out of the hotel in the morning, but only after I got my cheese fries for breakfast. *The breakfast buffet had such limited options I ended up eating cheesy potatoes every morning we were there. We made our way to the port of Palm Beach and grabbed a drink at Johnny Longboat's before we boarded the ship. Turns out, UF's spring break just so happened to be the same week as our cruise and their entire Greek life decided to go to the Bahamas for their break. Yay. We spent the night exploring the ship, gambling (only a little!) and pigging out at the all-you-can-eat buffet. Little did we know, the whole group of UF students would be staying at the same hotel as us, too. So after an obnoxious 30-minute bus ride with all of them, we finally made it to our hotel- the Viva Wyndham Fortuna. The hotel was all-inclusive- which meant free drinks for days! We ended up having to wait for about 20 minutes each time we went up to the bar, but the fact that the drinks were free made things a little better. After we got checked in, we hung out by the pool until it was time to go snorkeling. Snorkeling was one of the most exciting things I've ever done! We didn't have an underwater camera, but I will never forget how beautiful it was. After snorkeling, we walked around Port Lacaya for a while until our cab driver found us taking shots + eating conch fritters in some random bar. He joined us, then took us back to our hotel. We spent the night enjoying the breeze, the beach and the booze at the hotel. The next day was B's birthday! It started off with incredibly relaxing massages and then turned into an all-day beach day. We found the last two chairs on the beach and literally only moved to go get food. Right before the sun went down, we headed to our second excursion- a bonfire on the beach. I think B would agree with me when I say it was a disappointment. First of all, we were probably the youngest ones there. Second of all, the bonfire part only lasted about 10 minutes. Third of all, I wasn't a fan of the food they were serving. The best part was definitely when B had to get up and dance with the fire lady. Homegirl was literally swallowing fire. It was insane! Looking back, we definitely should have picked a different second excursion, but now we know better for next time! After we got back to the hotel, we got a couple drinks and hung out for a little while before calling it a night. Our last morning at the hotel, we decided to hang out by the pool and soak up as much sun as possible before we had to leave. We also finally got the chance to enjoy the hot tub. Literally every time we would try to go in, it would be packed full of people. So it was nice to finally have it to ourselves. We headed back to the ship and once we got settled, planted ourselves in some beach chairs to watch the sunset as we left the island. Both of us were exhausted at this point, so we just kept things laid back for the night. A little drinking, a little gambling, a little laughing and a lot of sleeping! Our last day of vacation was spent laying out on the top deck of the ship until they cleared us for disembarkation. We finally got off the ship and headed to Melbourne to pick up Daisy Bug from B's mom. Lucky for me, I had an exam the next day so we had to book it back to Statesboro so I could study and get some sleep. Overall the trip was a blast and incredibly relaxing (when we were a safe distance from the crazies). It was so nice not having to worry about responsibilities. There's just something about sitting next to your best friend on a tropical island while sipping on a pina colada and listening to the sound of the waves. Huge shoutout to B for planning this trip and making sure we had the best time possible. I love you so much! You can find my exact striped bikini here, my exact striped tunic here, my exact floral bikini here and my exact anchor top here. 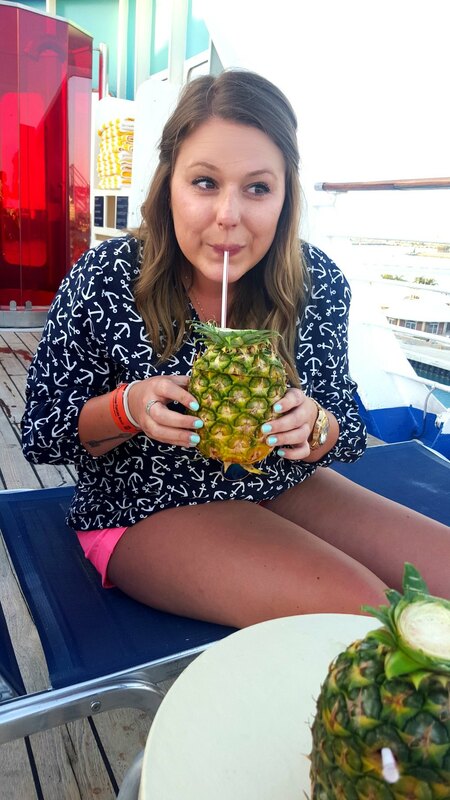 I've linked a TON of similar items below, as well as some of my fave cruise must-haves!